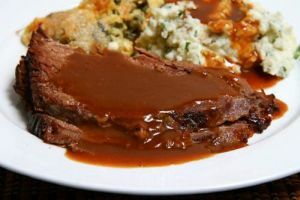 Stewed Beef with Gravy is a Dutch food recipe with gravy made from shallots and beer. Peel and finely chop the shallots and the garlic cloves. Dust both sides of the meat with flour. Bring the beer with the water to the boil. Heat the butter in a roasting pan and wait until the foam is gone then turn down the heat. Slowly cook the meat until it’s golden. Season with salt and pepper. Then take the meat out of the pan. Fry the shallots and the garlic in the butter until they begin to soften (about 3 minutes). Stir in the tomato puree and fry for another 1 minute. Put the meat back into the pan. Add as much water/ beer in order to cover the meat. Put in the bay leaves, cloves and vinegar and bring it to the boil. Cover the pan and turn down the heat. Let the meat simmer for about two hours. Season the gravy to taste with mustard, salt and pepper.